Spring seems to be finally showing itself, marking the perfect time to start those home renovation projects you’ve been holding off on starting. Spring is perhaps the most popular time for a home update in Winnipeg; the weather is nicer, and it creates a better environment for working. Homeowners often feel the need to make updates in spring, as they watch the grass and flowers grow, wanting to see the same great changes inside their home as well. One way to update the home this spring that is both simple and affordable is with paint. Paint can easily be used to update any area of the home with a little time and effort. The most popular way to change up the look of the home with a simple weekend reno is with the walls of your home. Paint one room or a few rooms, changing up the look and feel of the space. With paint, you can easily give a room a new look without breaking the bank. During a weekend, start your project by taping off the trim and ceiling, preparing the space to be painted. Make sure to prime the surface with a quality primer before you start painting. Using paint and primer in one product, although it can save some time initially, has its downside. Depending on the surface you’re painting, two-in-one products can peel incredibly easily. If you don’t want to commit to painting a whole room, you can always paint a piece of furniture to change the look of the space. Paint has come a long way over the years and can easily be used to revitalise old furniture. Take chalk paint for instance. A big trend right now is taking older pieces of furniture and painting it with chalk paint. This paint type dries quickly and can be sanded a bit for a unique look. Most old furniture – hutches, coffee tables, and dressers are especially popular choices -you have can be refreshed with a little time and some paint! Did you know that you can easily update your décor items with paint? From shelving to frames and other accent items, you can easily revamp your décor with paint. Depending on the material, you can use spray paint along with traditional paint. Choose bold colours that will stand out to create a conversation piece in the home or go with a neutral to create a calming palette. Not much of a DIYer, or prefer to spend your weekends and evenings socialising with friends and family? Hire a professional to beautify your house for you! At All Canadian Renovations Ltd, we can help with your next big design and paint project. Contact our office today to learn more about how you can renovate your home. All Canadian Renovations Ltd. is proud to announce our partnership with Enabling Access. 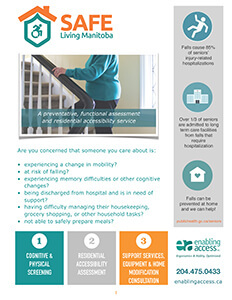 Enabling Access is an organization that provides a preventative service to Manitoba residents who require assistance or special accommodation in their living space. They can identify any independent living risk factors, and features or in-home modifications that may be required. Through Enabling Access, homeowners can receive a physical and cognitive screen of their residence to determine where accessibility features could be incorporated to simplify daily living. They will complete a full accessibility assessment of the residence and provide certified recommendations for services, equipment, and home modifications that can improve the functionality of the home. That’s where we come in. As the leading CAPS (Certified Aging in Place Specialist) approved renovator in Winnipeg, we have been selected as Enabling Access’s preferred community partner. Through the services provided by Enabling Access, residents can connect with us, and other community partners to access the equipment and services that are designed to simplify their daily experiences. To learn more about Enabling Access and the services they offer, visit them at http://enablingaccess.ca/. To learn more about CAPS renovators, visit http://acrltd.ca/about/certified-aging-in-place-specialist/. If you, or someone you know, requires renovations to their home to improve the accessibility of the residence, contact us today!